Happy Easter to everyone. I hope you have a fantastic day. My boys decorated some Easter eggs today. We got a couple of different egg decorating kits, some with the dye that you dip an egg into and hope the color sticks to it. Another had little sponges that you use to dab paint on the eggs (this was by far the best and most colorful method), and the last had dye plus stickers so you could make your egg look happy with eyes and a big smile. 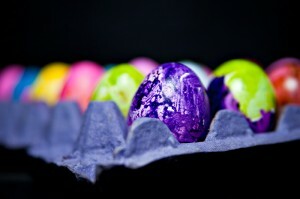 I used a Canon 580EXII with a Lumiquest Softbox III at 1/128th power and hand-held over the eggs.